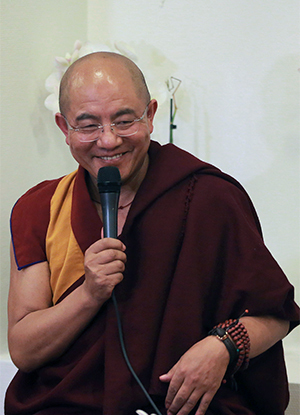 In this talk, Khenpo Sodargye Rinpoche mentions that though science advances greatly and has contributed a lot to the improvement of our material life nowadays, it doesn’t do much in the discovery of our spiritual world. This is far from enough, since true happiness exists only in the inner mind rather than in the outside world. Meditation is an excellent way to achieve eternal happiness. 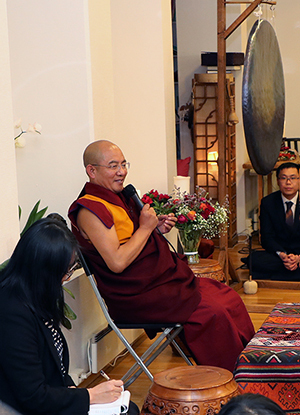 In the talk, Khenpo talks about four levels of meditation, and suggests everyone to practice meditation in daily life so as to realize the inner self and achieve the meaning of life through benefiting others. Real happiness does not rest in the saddest moment or the happiest moment; the happiest state is when you feel the most satisfied. Real happiness actually comes from our inner mind. Only after realizing the nature of mind can we obtain ultimate happiness, which is achieved best through the practice of meditation. To some extent, science is like the young, while the traditional culture is like the old. Nowadays a lot of people advocate the idea of science, and tend to discard the traditional culture and religion that has existed in history for thousands of years, regarding the latter as useless and obsolete superstitions. They label themselves as non-believers who don’t believe in God or Buddha, or any mysterious thing whatsoever. However, they do have something that they in essence worship, which though not titled a God, but is actually a new form of “god” or “deity” for them. Everyone has a “god” in their mind, though the “god” may have many variations. Nowadays, almost every young person is fascinated by computers or cellphones everyday, through which he or she can see various things like animations, Hollywood movies, or some bizarre and mysterious pictures. So, actually everyone has an abstract god to worship in the mind. Here, I’d like to introduce different levels of meditation in Buddhism. The basic level of meditation is the one that helps us to be relaxed both physically and mentally, releases us from all pressures, and lets us be in a state without grasping onto any annoying worldly affairs. That’s a preliminary practice of meditation. A higher level is to keep the state of mindfulness. If any negative emotions arise in our mind, such as hatred, jealousy, and excessive desire, just observe them directly. Then, these negative emotions would gradually disappear by themselves. Thus, abide in the state of mindfulness. A further level of meditation is to observe the mind via our own mind. Through a peaceful way of introspection, the true nature of the mind can be realized. That’s the so-called awakening or enlightenment in Buddhism. Enlightened beings won’t be trapped by any afflictions or pains. They can lead a very happy life even in a country with low happiness index. In the highest level of meditation, practitioners can rest in the state of introspection and clear awareness in every behavior in daily life, either walking, standing, sitting or lying. Meanwhile, with the power of spiritual enlightenment, they will be able to selflessly benefit countless beings. They can do very great things while abiding in the state of enlightenment. Just like we need to regularly take bath, wash our face, and do the cleaning, we also need to clean up our inner mind frequently. Otherwise, our emotions would get out of control at some point. In that training our mind in meditation can’t be rewarded immediately after one or two practices, we should develop this habit over a long term. Then gradually, our tough mind will become malleable and liberated. In a certain time, no matter what happens in our life, we can face it bravely and in an easy manner. When you fully realize the nature of your mind, you will never be passive or slack off. On the contrary, you will treat your family with a more kind attitude, have a stronger sense of responsibility toward this world, and hold a stronger sense of caring for others in the society. This can be seen from the stories of many great enlightened beings in history that, as long as they have fully realized the truth of life, they would never isolate themselves from the world and enjoy their own peace and joy in solitude. They are never hedonists. Instead, they will try their best to spread their true love and wisdom to every being if possible. Whenever ourselves or our family members fall into a low ebb, we should learn to face and accept it. Actually we should not run away from any adversity in our life but face it bravely, which also calls for some skills. So sometimes it is necessary to consult the learned or figure out an appropriate way to solve it by wisdom. In fact, some bad times or unfavorable situations are the opportunities for us to learn and grow in life. In this sense, it may not be that bad. Anyway, there should be a lot of ways out. Actually we should not run away from any adversity in our life but face it bravely, which also calls for some skills. So sometimes it is necessary to consult the learned or figure out an appropriate way to solve it by wisdom. In fact, some bad times or unfavorable situations are the opportunities for us to learn and grow in life. In this sense, it may not be that bad. Anyway, there should be a lot of ways out.